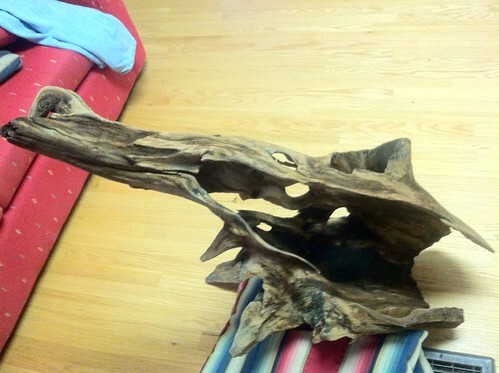 No, not mine, but this driftwood hunk has taken up residence here since I found it on the street on trash Thursday a couple months ago. We keep each other company, neither of us claiming ownership of the other. Before you think it... no, I'm not a Thursday trash-diver. I only trash-dive on Tuesday. THAT is pick up day in the area across the tracks- the good side. I sell the gentrified folks' trash back to them, on e-bay! Yes, that fine September day, I could see from a hundred feet away as I walked that this was a prize piece, better than anything we'd ever stumbled upon at whatever lake or river we'd visitied, and there had been some really good pieces found in the past too. I hauled it home, heavy as it is, because I like such things. Yeah, hollow yet solidly heavy. 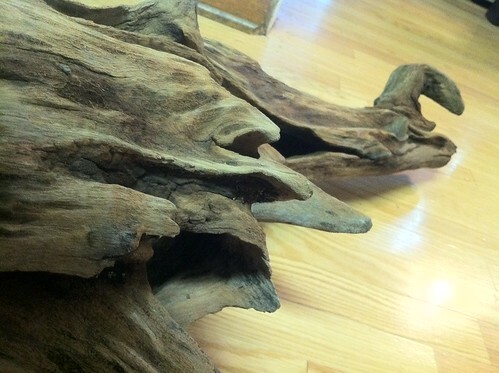 The wood is as hard as Herman Cain's head, yet infinitely more likable. The other day I loaded my chill partner up in the passenger seat of my truck, prompting it (both he and she... it? I guess) to ask me in our own silentlanguage... "what the heck tr ig? A ride? I don't like rides too very much. Oh no, prefer to stay in one place. Yup." I said nothing, not even silently, as we drove to the carwash... didn't know how my dawg would feel about about the power spray treatment I had planned. I imagine it hurts.. assuming it did, because the trip home from there was one spent in stony silence. 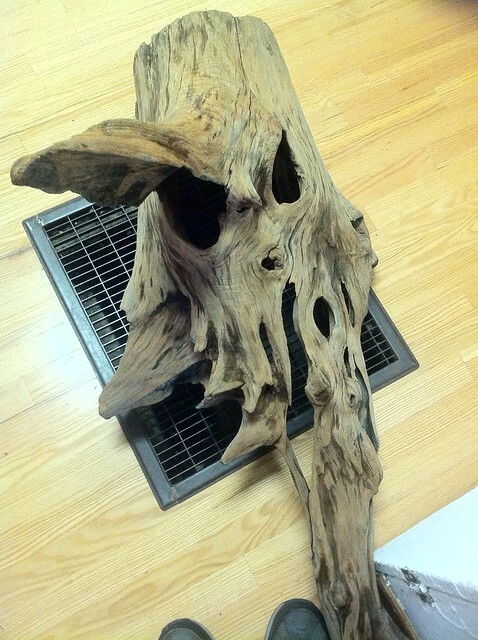 Upon return, I sat my newly cleaned driftwood specimen and partner over the heat return vent to dry out. That's when I started noticing the creatures and such within and broke out the camera, after asking permission which was only granted when the drying process had begun and the power-wash sting faded. Here, reminds me of some ghoul from the movie "Pirates of the Carribean." An odd angle, just for an overall look. Here though, I notice root remnants that now look like shark's teeth, or the outer spiny plates of the stegosaur. Why is it there are similarities all over in nature? 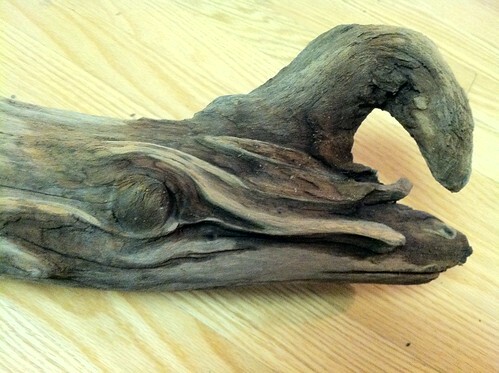 Why the animals in clouds, in wood and elsehwere? Is it just a matter of human perception, or, as it seems to me, are we all connected more deeply than us puny humans know? "yeah tr ig, believe it or not, I once saw a human that looked exactly like a tortoise." .. and the eye, the lips, the nostril even. A very wise and old dragon. I asked, "so, are dragons real.. I mean, do they really exist?"